Hi! 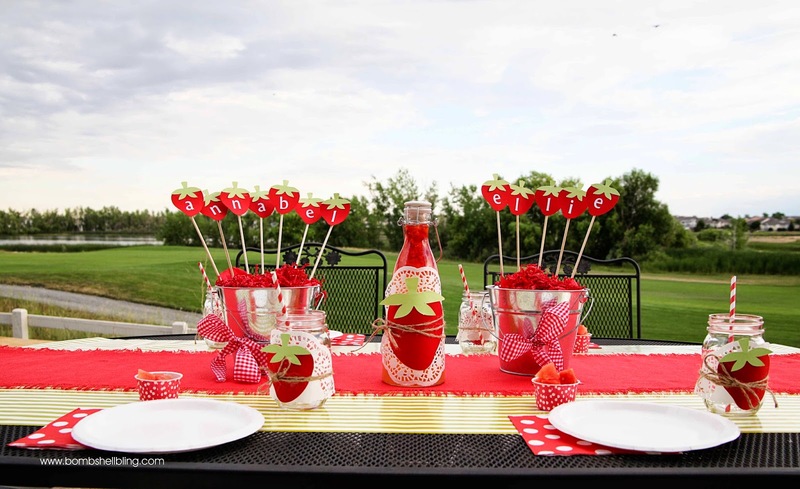 Angela here, and today I am excited to share with you a strawberry themed birthday party. 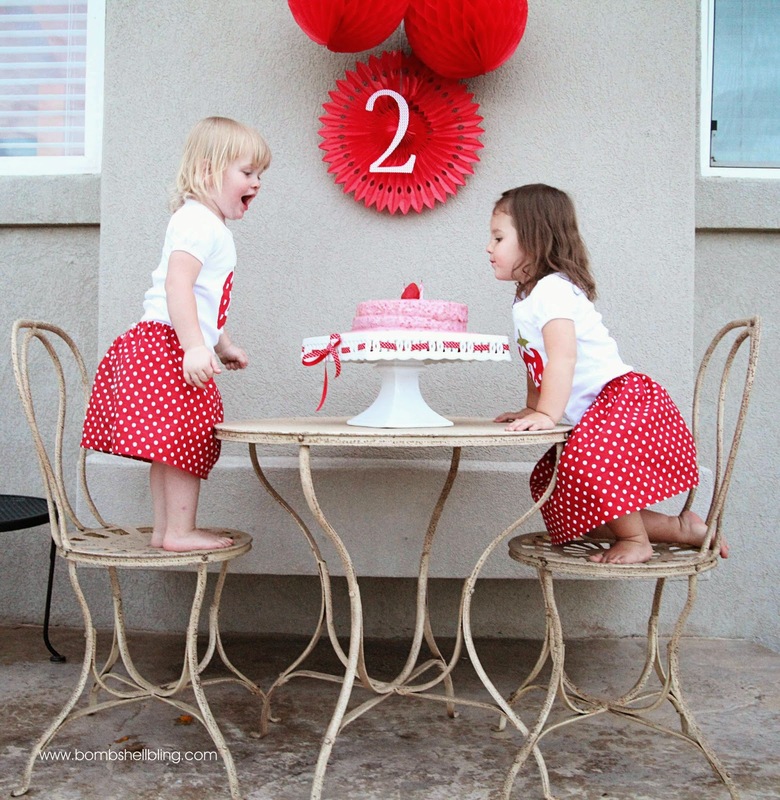 My daughter and my niece recently turned two. In fact, their birthdays are just a day apart from each other. My sister and I were coincidentally pregnant at the same time. Our due dates were two weeks apart. I came a week late, and my sister came a week early. Our daughters ended up being born less than 24 hours apart from each other! Unfortunately, these two cousins live in different states and don’t get to see each other much. This year they happened to be together on their birthdays so we decided to take advantage of it, since who knows how many times that will be the case. (Although, hopefully many times! ) 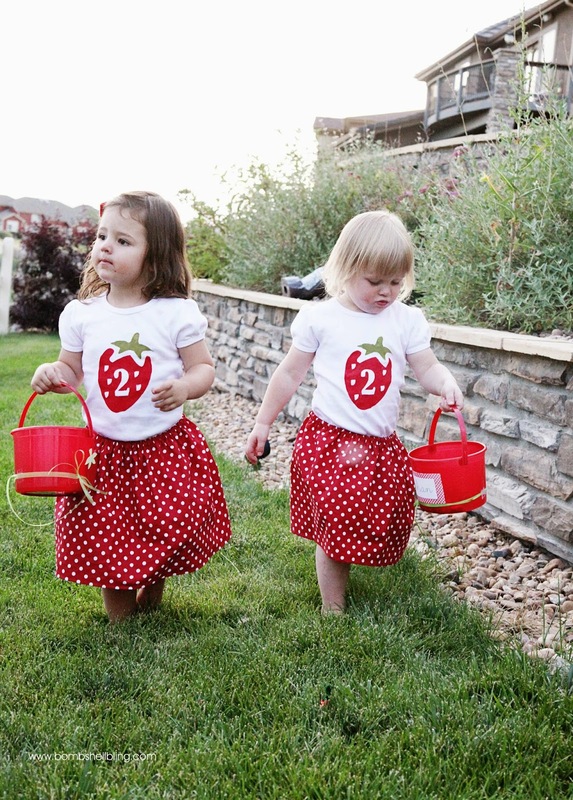 Since these girls love their strawberries, we threw them a little strawberry themed birthday party to celebrate them turning two! I had way too much fun putting this little party together. Everything turned out so cute! And best of all the girls had a great time! 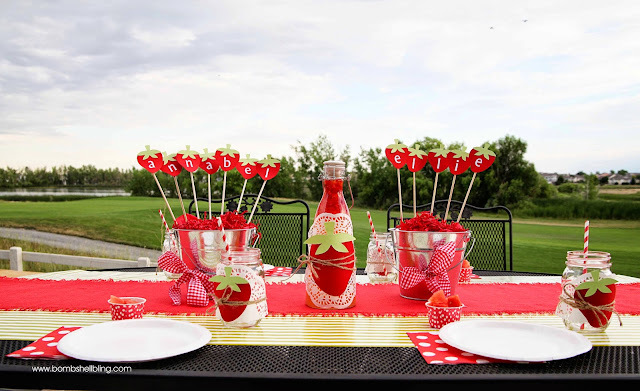 First on the agenda for the evening was a yummy dinner eaten at a very strawberry themed table. Strawberry lemonade was on the menu for the evening. 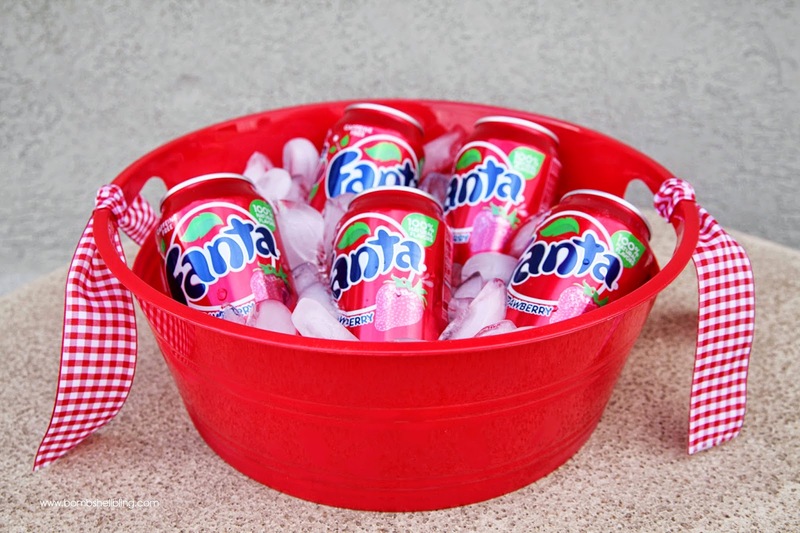 Strawberry Fanta was also available. 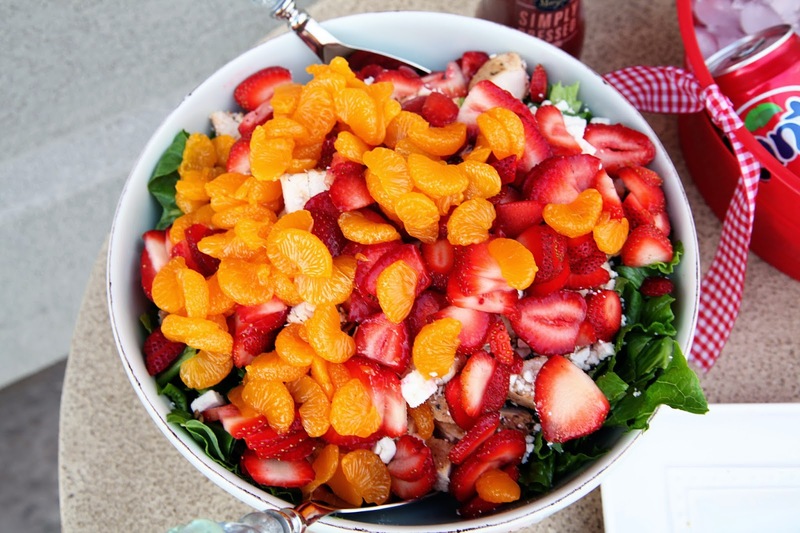 We ate the most delicious salad made with strawberries, balsamic rubbed grilled chicken breast, mandarin oranges, feta cheese, sesame seeds and a strawberry poppy seed dressing. Yum! 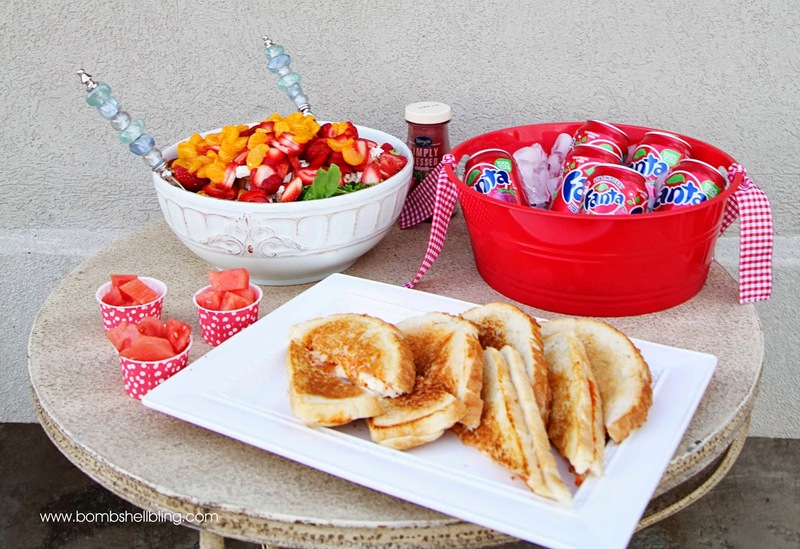 We also had delicious red pepper pesto paninis and just to mix things up a little we offered some watermelon since there were plenty of strawberries in the salad. After dinner it was time for games. Our first game was “picking strawberries”. 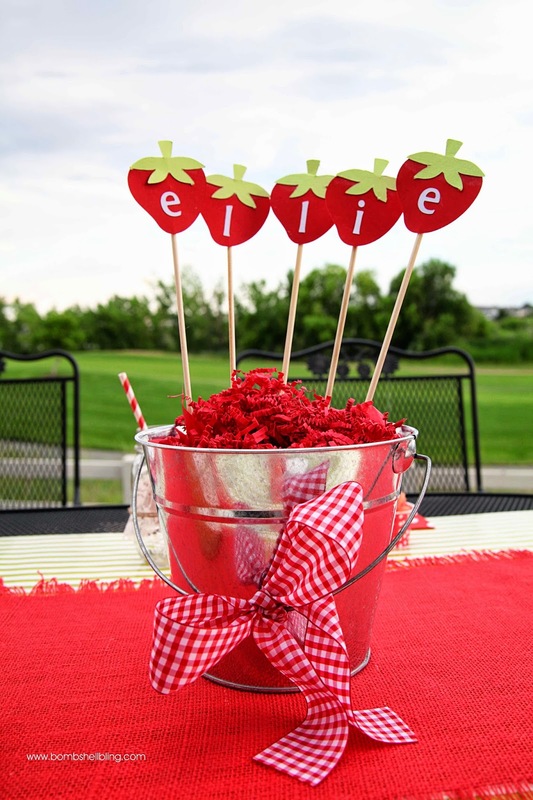 I had made each cousin a strawberry bucket with their name on it. 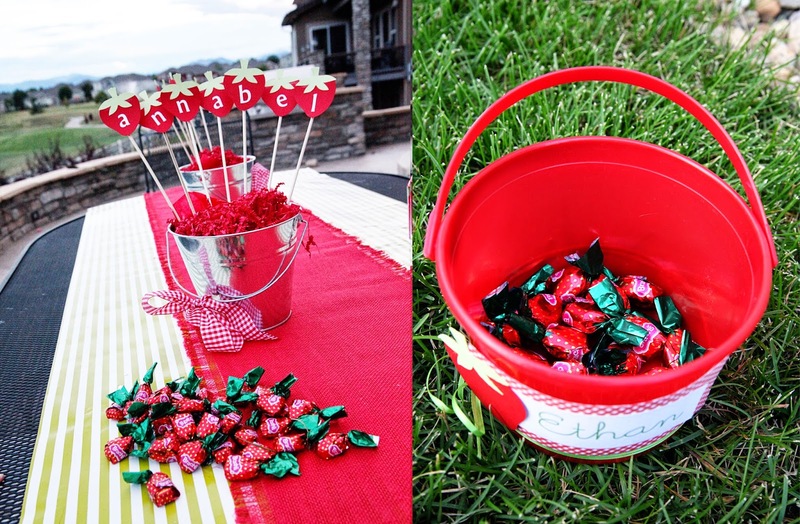 I hid Brach’s strawberry wrapped candies around the yard. The kids got to go find them and put them in their buckets. Oh, wow, this was a hit! We were re-hiding the candy all night for the kids to find. They loved playing this game! 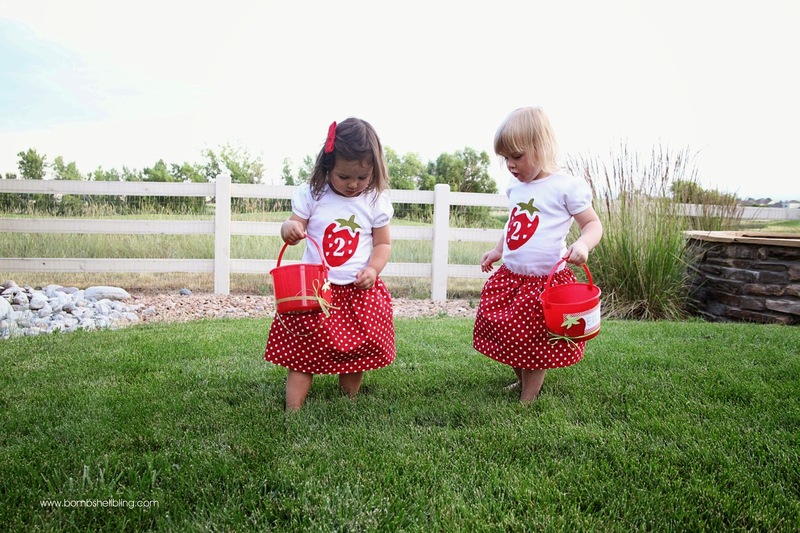 They were too cute picking strawberries in their matching strawberry outfits! 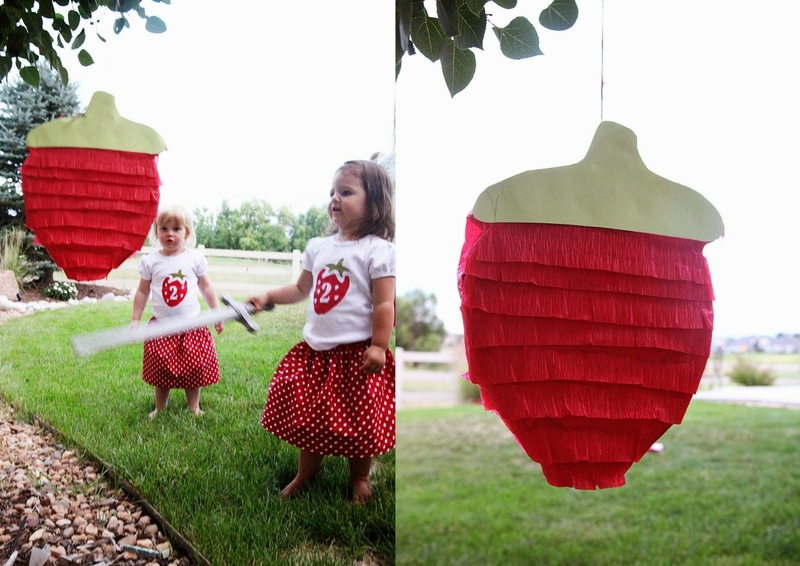 We eventually had to cut off the candy hiding so that we could get to our strawberry pinata before it got too dark. By the way, I am kind of obsessed with making pinatas. After I made one at my son’s Lego party, I realized how easy they are to make. I love it! 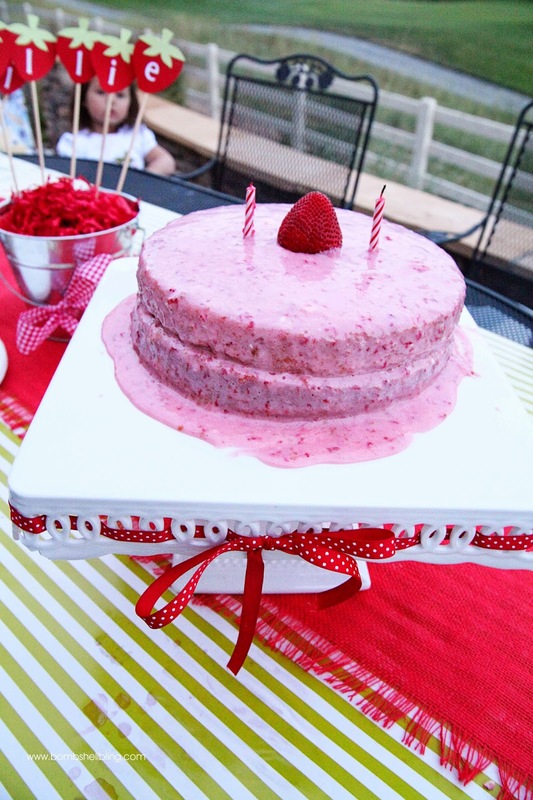 Of course, we finished the night with some of my mom’s famous strawberry cake! It is so delicious! 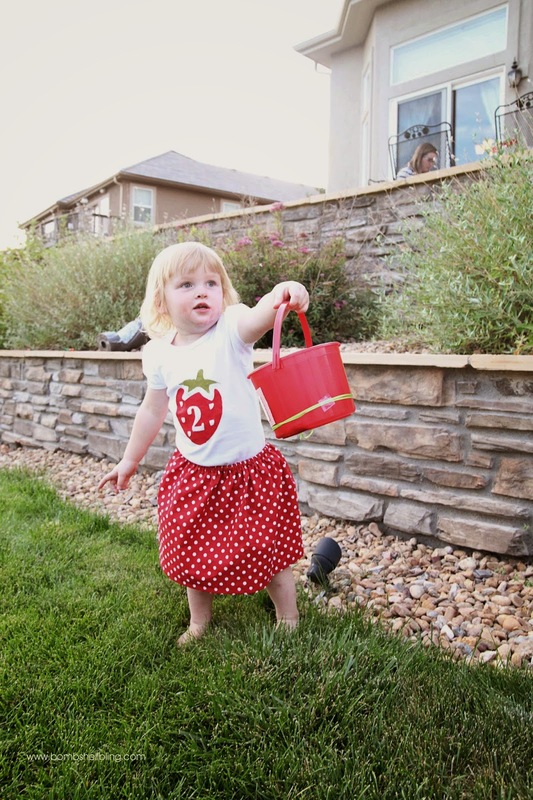 Happy Birthday you cute strawberry loving two year olds! One of the cutest things I have seen in a long time!! LOVE!! SO cute, Sarah! I love all the details!! Thanks for linking up to The Creative Collection Link Party! Pinned! Fabulous job and really do-able! Love those outfits, just the greatest, good for you! thanks for sharing on craft schooling sunday! So fun! Little girl parties are the best to plan. Visiting from Create It Thursday. Oh my goodness! The girls are so cute! 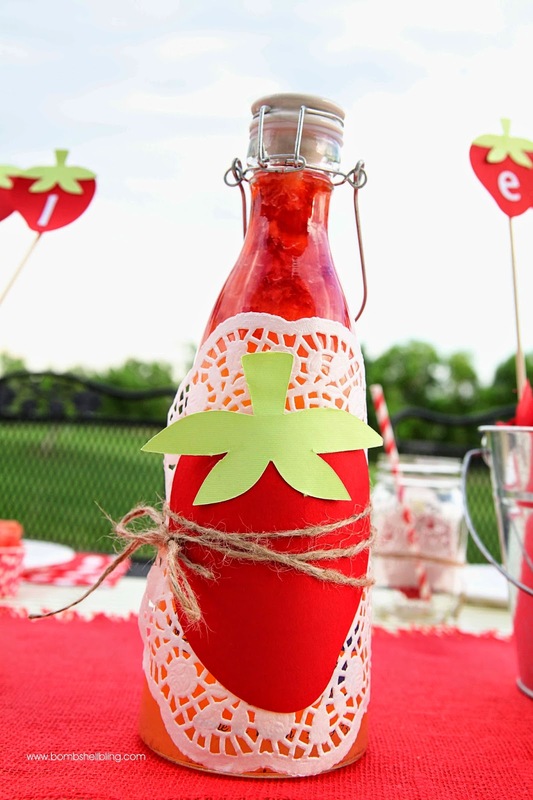 What a fun idea, I love strawberries too! Where did you get the shirts from? 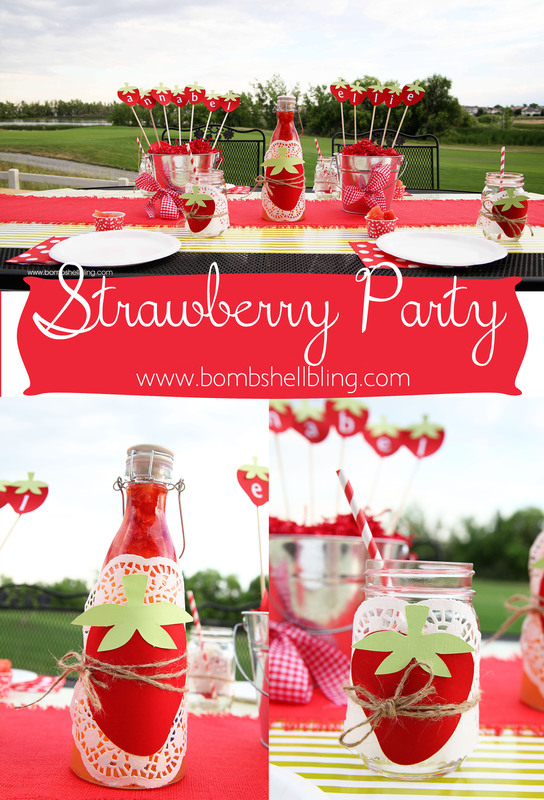 I am doing this exact theme for my daughters birthday party and her aunts have made all decorations handmade. 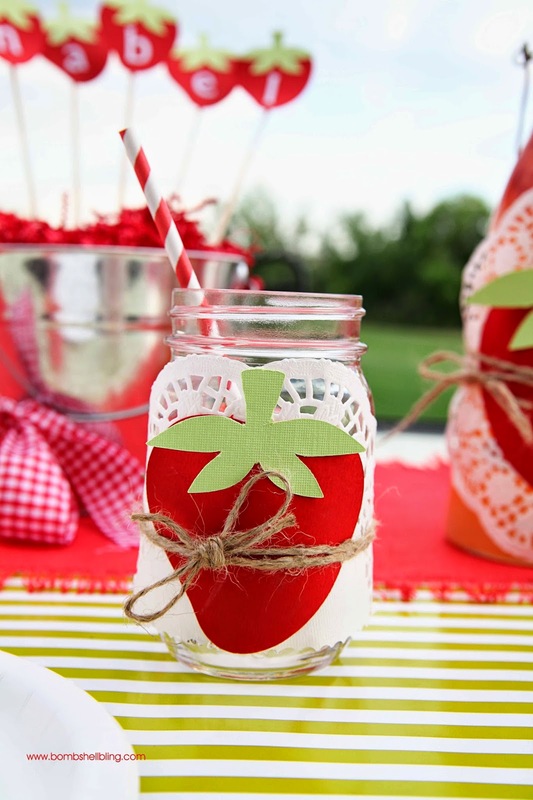 Love your party idea!! I’m sorry, but I don’t know. This post was from a former contributor. 🙂 Good luck with your party! !